Wax nostalgic about and learn from the history of early electronics. See articles from Short Wave Craft, published 1930 - 1936. All copyrights hereby acknowledged. 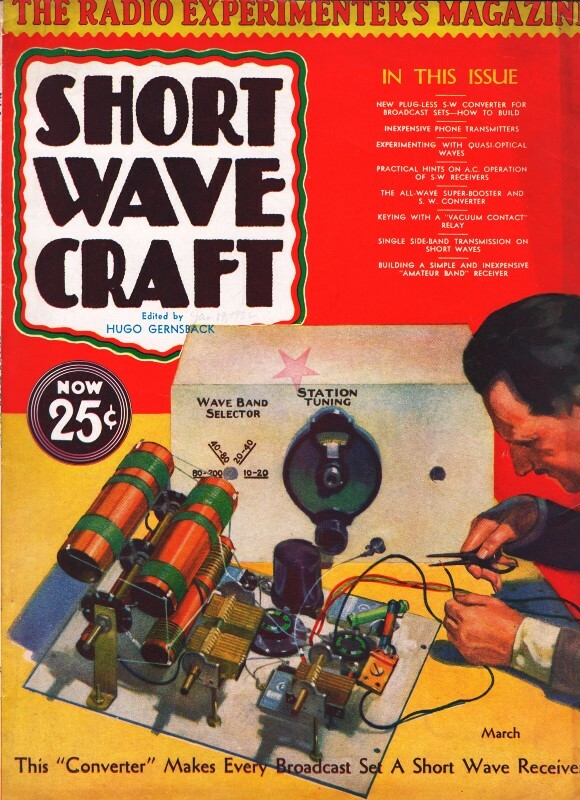 This is the second of a two-part series discussing the propagation of shortwaves, the first part having appeared in the December 1931 / January 1932 edition of Short Wave Craft. Keep in mind that at the time of the writing, no instrumented sounding rockets had been sent into the upper atmosphere for empirical measurements, so the author's conjectures being inaccurate are forgivable. Mr. Meyer's supposition that there are "cosmically-located network of conductive lines" that influence seasonal propagation as the earth moves through them during its revolution around the sun is actually not an unreasonable theory for its era. It certainly is no more outlandish than a modern-day celebrated astrophysical genius proposing a series of vibrating 'strings' in an 11-dimensional universe. According to this assumption, there hangs over the earth on the day side, a multiple "umbrella," which contains besides the lines shown, all the intermediate stages. At the same time there is a possibility of communication between any two places on the surface of the earth, which are touched by the same line of conductivity. The lines themselves are given continuous excitation from solar electrons. In the course of a day, in view of the rotation of the earth, each point on the surface of the earth describes a fixed path in an umbrella-like conductive structure, and finds operating conditions periodically changing. Besides the daily revolution, the earth annually completes a circuit about the sun; whereby there is caused a constantly changing angular inclination of the earth's axis to the sun. This second motion of the earth in the cosmically-located network of conductive lines (which are therefore fixed in space) is the cause of the changes in range which occur during annual periods. Diagrams (Figs. 4 and 5) used by author to explain action in short wave propagation. The previous considerations dealt with the common features of the propagation of all short-wave frequencies; and it now remains for us to consider the principles governing the reception of the individual frequencies. From the collation of numerous observations, we find that the reflection curves are. the same for conductive lines of all frequencies; but that they are differently oriented in each case. If known ranges of different frequencies, from the same point on the surface of the earth, are collected in a diagram, there results a separation of the frequency lines according to a uniform principle, as shown in Fig. 4. The higher the frequency, the longer the reflection path, but the curve itself always remains the same. The only difference is the angular position of the path; so that a "spectral" dispersion of the solar electrons must be presupposed, analogous to the dispersion of light in a prism. The process maintained in Fig. 4, is shown again in Fig. 5; but in such a way that the curves are covered and the hitherto coinciding facts of (compass) direction are different in the angular position. Now a measurement can be undertaken on this graph and it appears that, for 15 degrees difference in direction, there is a wavelength difference of 10 meters. The previous diagrams, which were for the 20-meter wave, can now be filled out on the basis of curves in Figs. 4 and 5 for all frequencies. The writer's theory therefore involves the assumption that there is, for every short-wave frequency, a network of conductive lines, fixed in space. I imagine these networks as being formed of spectrally dispersed solar electrons, serving as a non-resistant conductor (i.e., one with no loss) for the corresponding transmitting frequencies. Then the night side of the earth gives a path for a signal only if it is touched by a conductive line formed on the day side of the earth. If there is no conductive line, there is no possibility of communication. - Wissen und Fortschritt.